ST. PETERSBURG. Nov 22 (Interfax) – Mikhail Amosov, a deputy of the St. Petersburg Legislative Assembly, said he is leaving the Yabloko party. Several dozen others in the region have also left. “The wish to decide from Moscow who will run the organization, who will be included in the bureau, the issuance of yarlyks for princedoms – unfortunately, these things have become a system for the Yabloko party. Similar mechanisms have been used not only in St. Petersburg, but also in the Moscow office, in Primorye, in Bashkortostan. The list goes on,” Amosov told a press conference on Thursday. Forty-eight members from seven district divisions have left the party. “If we are for the democratization of our country, ambition and will for democracy need to be demonstrated inside the structure that is working on it. It’s probably a moral issue that made many people leave the party,” the parliamentarian said. Amosov said he will continue working with Boris Vishnevsky, the leader of the Yabloko faction in the Legislative Assembly. Former members of Yabloko have created a new public organization, the Democratic Renewal Movement. Sergei Nazarov, the former head of the party’s Kalininsky district branch, was elected the chairman of the movement. Earlier, Amosov publicly criticized Yavlinsky and said there is “a deep philosophical crisis” in the party. 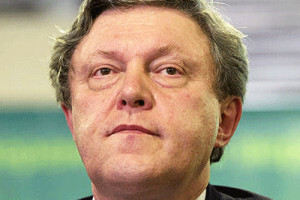 He was later replaced by Yekaterina Kuznetsova, a former representative of Yavlinsky.